V.180 – V: Champions is live on January 18, 2017! 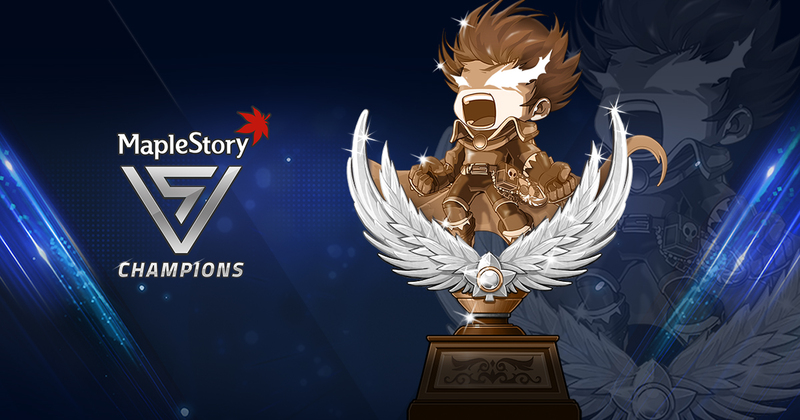 Join us for the V: Champions update which celebrates the true heroes of MapleStory, YOU! Take part in our appreciation event, and receive free gifts when you log in. Then see if you can set records with your playstyle as you participate in the Maple VVorld Records event! Lunar New Year and other events are also available! http://maplestory.nexon.net/micro-site/v-update/19950 - See here for more details! For those who actually came back to see an old memory... I am here to leave possibly a final message. Good evening Snowpatrol it's been so long since the beginnings. It felt just like yesterday, but most if not all my memories of it have vanished as I've moved forward. I've played this game for over a decade now and I've improved quite a bit of my English, take a comparison between my previous posts. A lot has happened over the years. According to the last announcement which was in November 2008 V.62 the last version I posted was back when Pirates were released, the 5th Adventurer Job to be released with the branches of Gunslinger and Brawler. https://www.reddit.com/r/Maplestory/wiki/guides - /r/MapleStory Returning Mapler Guide! Q: Wait how many people actually viewed this post? A: The views are counted by how many times this page has been clicked/refreshed. It's probably lower than displayed. Q: Why can't I click some links? A: Links that are outside this forum cannot be clicked on if you're not logged in. Instead, copy-paste the URL/link into the search/url bar. Q: Are there still hackers in-game as of today? A: Yes, hacking still exists. If not the same it has advanced. Q: Is 5th Job a thing now? A: Yes there is an actual 5th Job Advancement. It starts off as a quest at Level 200. Q: Do you still play MapleStory? A: I still play MapleStory. My current IGN(in-game name) is Its2Sharp4U. I am a Blade Master (a third branch adventurer thief) and currently Level 221. I retired my character Matesword in July 2010 V.88 when Dual Blades were released. Q: Is there a new level cap? A: Yes the current level cap is 250. Q: How much has MapleStory changed since 2008? A: You wouldn't even recognize it. You would have to catch up by either reading it or playing it. Trust me, playing it is a lot easier than reading. Have a guide by your side if you do though. It'll make things a bit easier to understand what has changed. Q: What happened to <insert person here>? A: Sorry, I'm not too sure. I currently have no form of existing contact with anyone in Snowpatrol aside from this forum. Q: What happened to <insert previous MapleStory content here>? A: You will probably have to look it up. It either may have been modified/changed or removed. Q: Do you still enjoy the game? A: MapleStory is one of the games I still play to this day. If only Nexon were to provide better service. Q: Where can I contact/reach you? https://www.youtube.com/user/Matesword/about - YouTube: On the top-right there should be a "Send Message" button. Or you can post it in my channel discussions. http://forums.maplestory.nexon.net/profile/236/Its2Sharp4U - Official MapleStory Forums: On the top-right there should be a "Message" button. Or you can post it into my Activity. I may not respond immediately, but my time zone is Eastern Standard Time. Hopefully this won't be outdated if someone were ever to come to look at this post. The nostalgic memories of starting out this game and moving forward. It's such a shame that our guild had fallen to the grasp of hackers. Who knows what the future would have become if it wasn't for that incident which I do not even remember. Maybe our paths will cross again in this lifetime, or the next.